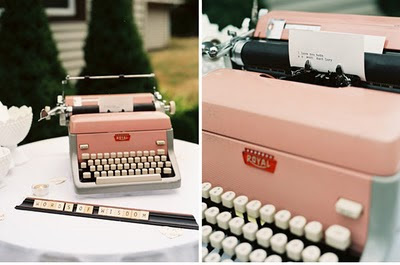 Another guest book idea that I adore is the typewriter-as-guest-book. It's chic, it's cheeky and it's really fun for guests. I haven't used my typewriter for several years (typewriter repair is a hard thing to find around here), but this idea is enough for me to search beyond county lines for a fix. There are so many colors of typewriters out there (check Etsy too!) that you can easily incorporate it into your event decor.